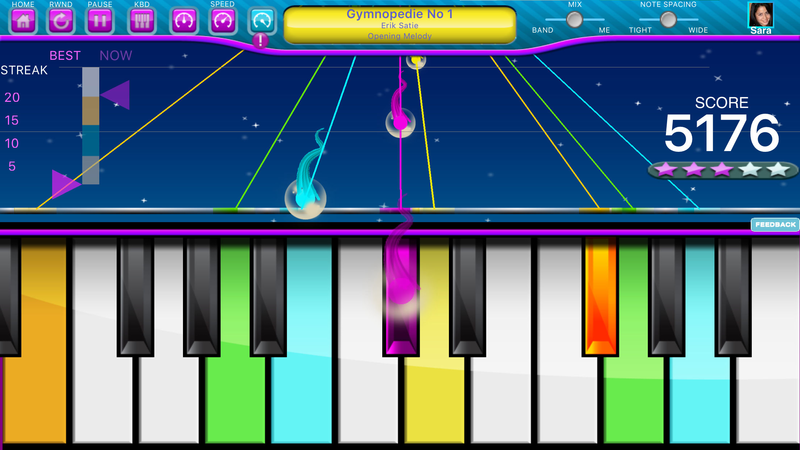 Play Along Keys is a music performance game for everyone from Real Keys Music that is both fun and authentic. With most music games, you play on a simulated piano or guitar, but when you play the same way on a real piano or guitar, your playing is meaningless. Not so with Play Along Keys! These are the real notes of the song. 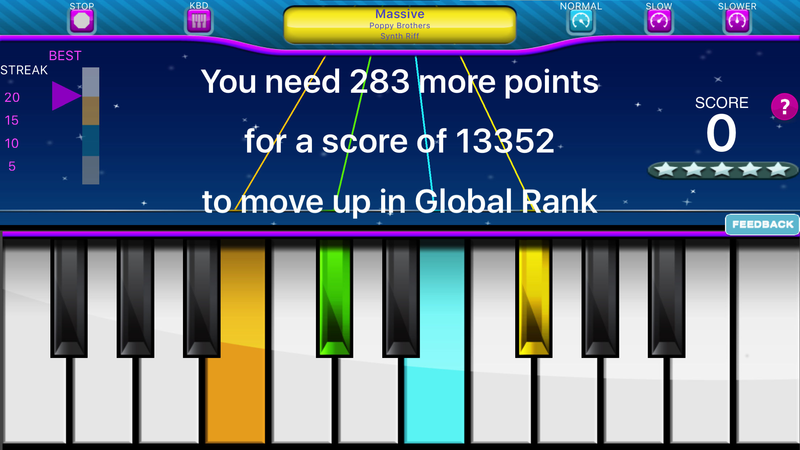 If you play enough to get a high score, you may find that you can go to a real keyboard and play the same song part that you did in the game. Play Along comes with a free large set of song-games. Bruce Cichowlas made the discovery that for many melodies and other musical parts, only about seven different keys are needed to play them. If only those keys are highlighted on the keyboard, it makes it much easier for a novice to find and remember the keys. This is similar to the reason that people can remember seven-digit phone numbers easily, but not numbers with more digits. It is also similar to the number of actual things that you do on a game controller regularly --- often four directions and about three buttons. Play Along Keys was originally designed for the XBox and required a special keyboard to highlight those keys for each song. However, the increasing capabilities of the screens and audio of tablets and phones made them a natural for Play Along Keys. The first version of Play Along Keys had only a few songs. 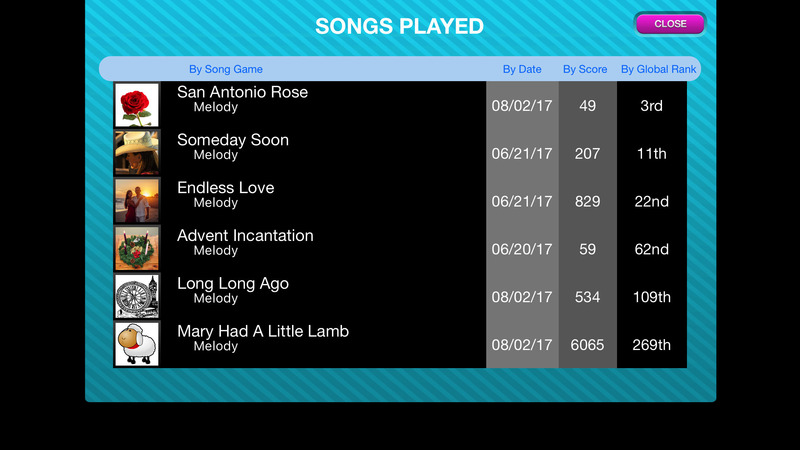 There have been many updates to add many additional songs as well as better analysis of the player's performance and comparison with local, Facebook and global players. 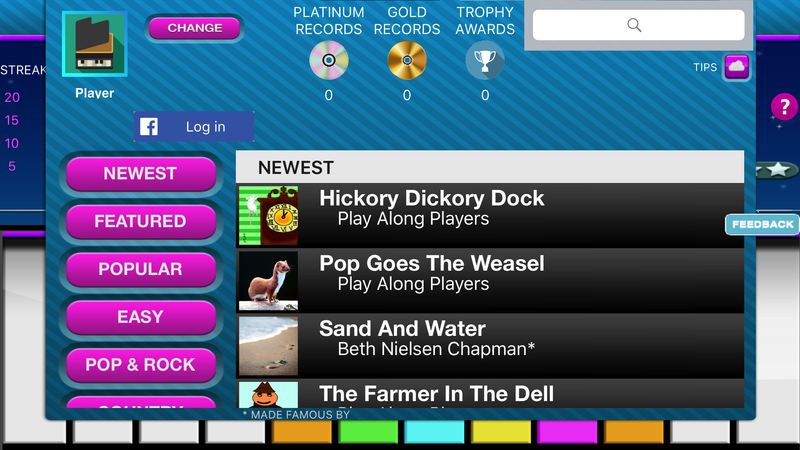 Play Along Keys welcomes requests for additional songs. 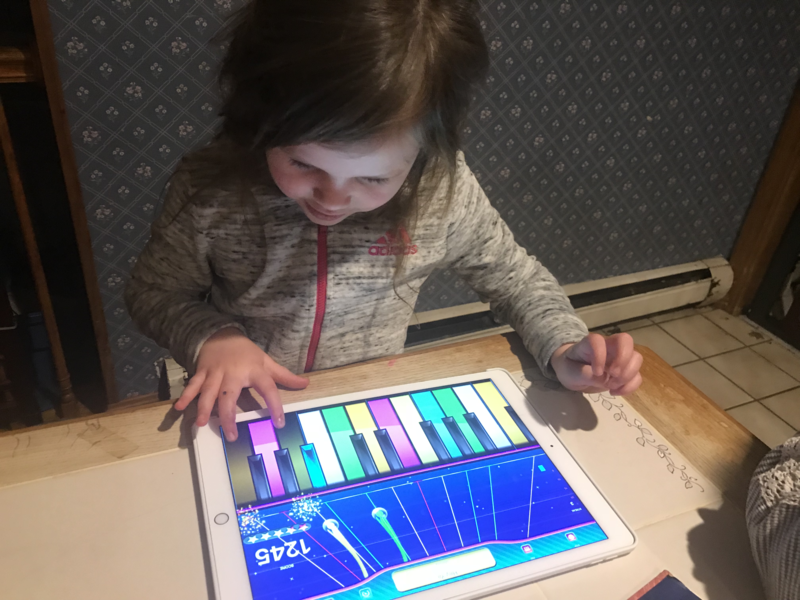 Real Keys Music offers Play Along Keys free without add-ons or advertising to promote peace and understanding through playing music. It is intended to be safe and useful for all. As a performer, Bruce noticed how easy and natural it was to trade music ideas in jazz or a jam with players from other parts of the world or from different cultures, even if no spoken language was shared. This seems so important and valuable that Real Keys Music has covered the development costs and music production costs as well as the server costs and music licensing fees in order to bring this to the public. Perhaps some day a sponsor will be recruited to help cover costs and be associated with the app in a NPR-like sponsorship way. Both popular and traditional new songs are added on a regular basis. Capabilities have been added to track each player's performance with their local and Facebook friends, as well as track global performance rank for a song. There are far more images available for Real Keys Music - Play Along Keys, but these are the ones we felt would be most useful to you. If you have specific requests, please do contact us! "People communicate by playing music together without even sharing a language. It's important for mutual appreciation, understanding, communication and peace. That's why Play Along Keys is free and safe for everyone." 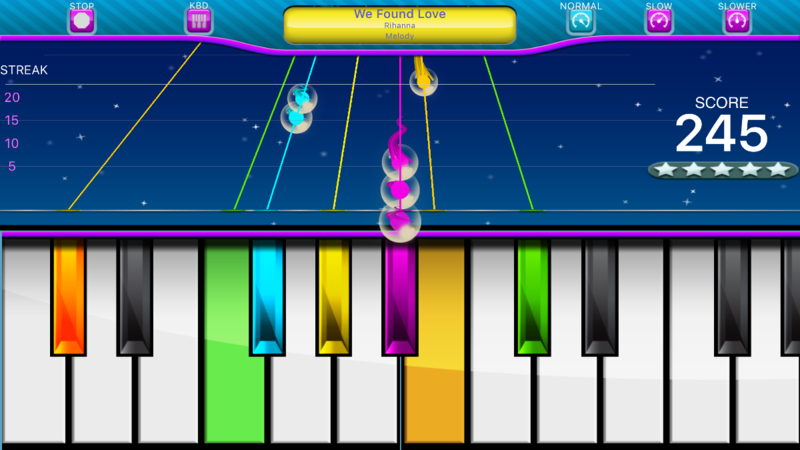 "Fun music game with a wide range of songs to play along with. Hoping this improves my piano playing." "The interesting thing about Play Along Keys is that not only is it melody-matching as opposed to rhythm matching, it's actually educational. So you learn the song on the keyboard and you can transpose it to a real piano and you'll be able to play that song." 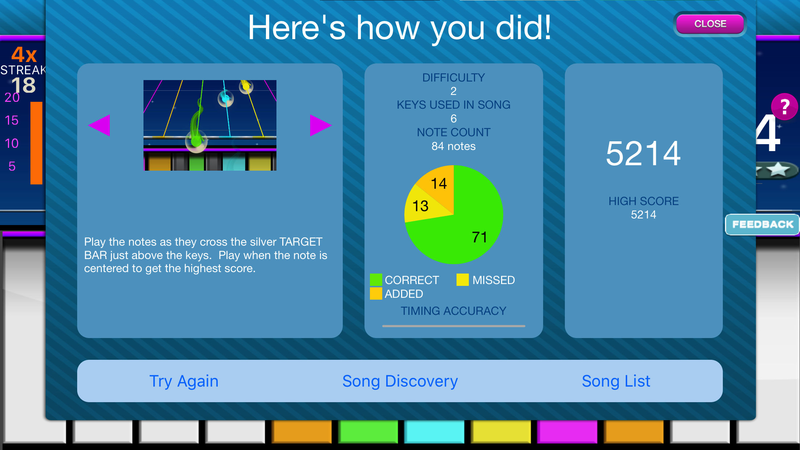 "This game has its own fun way of teaching the player to learn some of their favorite songs. There are three simple steps to learning your choice of song. 1. Pick a song in the Play Along library. Almost every week this game is updated with more songs. 2. Practice what you learned on Play Along Keys. 3. Take your skills acquired to a real piano. This was a fun overall experience which is why I gave it 5 stars." "Before I played this game I was a non-piano player, but now I can pluck out tunes and play the songs a real piano that I have played in the game! It is so much fun and super addicting trying to earn all platinum scores for each song. This app is incredible!"